I finally got around to setting up a place for you to purchase my book direct from my family room to yours!If you have an Australian postal address you can now buy the WholeLarderLove book directly from me HERE. Today I wrapped up my first batch, and I felt a little proud as I wrapped each book. I'm still very much a backyard operation. I love it! Just in case you get excited about my packing skills, don't. I'm one of those male's, you know the ones.....we lack the skills to make things look pretty. I have done my best. I used hipsters paper and hipster string. But the practical twitch embedded in me made me thick wrap each precious book in bubble wrap. I'd hate for a book to arrive all battered and crappy just because I wanted it to look good wrapped! Each week now I'll wrap up a bunch of books and send them to you. I really hope you all enjoy it and cook plenty of hearty meals from food you've grown or acquired the old way. PS. Sorry for anyone outside of Australia, I can't ship to you, but you can buy the book here. Firstly let me just say thank you to all those who have at some point taken the time to read my blog. The only reason I continue with it is to share my world with you. 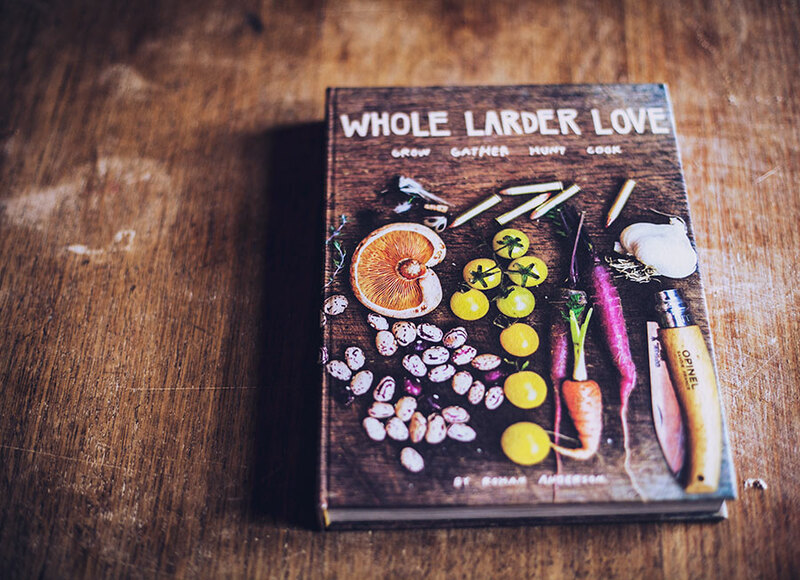 And as some of you may know my world will also soon be available to read in the form of a new book, cleverly named Whole Larder Love after the name of the blog. It took a team of creative geniuses to come up with the name for the book. My initial suggestion for the book title was 'Cooking and Stuff with Rohan' but the publishers didn't like that idea. Apparently it didn't have the right ring they wanted. I have two publishers, one in America and one based in my home country Australia. Thus there are two versions, and the distinction is in measurements, imperial and metric. Pick your choice. Below I've provided two links for orders. The book appears to be online at many internet retailers, and it will also be available in all good bookstores of course, so order where you want to, but remember the difference for US and Australian measurements. AUSTRALIA (Released September 26th)- PRE-ORDER HERE at Readings and get a signed copy. Earlier this week I wrote about eating in season, and I mean really eating whats in season, not whats available all year round in your supermarket. It makes sense to me to do so, you're eating whats the freshest at that particular time of year...not what's grown thousands of miles away and requires refrigeration or treatment to get to the stores shelves. It's not everyone's cup of tea I know, but I enjoy the approach of the long wait of a full year until the ingredient returns to the season. I'll cook it when I can either grow it, forage it or legally hunt it. I work for many of meals, I don't work to earn money to buy all my ingredients, just some....the rest I take care of myself. The natural balance of things would be much sweeter if we all lived on seasonal produce, the environment would benefit...I'm aware that it's a pipe dream, bugger it I like to dream big. Imagine if we all ate fruit and veg when it was in season, grown by ourselves of bought from local growers. Consider the reduction of emissions from food trucks on the road, even better think of the reduction of internationally delivered fruit and veg transported by boat. Just sayin'....should we really be cooking with garlic from Mexico when we live in Australia? Seems like an awful long way to ship garlic. Have we gotten to the stage that we demand everything we want, do we lack the ability to wait, to go with out? In waiting you develop a real hunger. I CANNOT wait to pick this new seasons tomato, which will be warm off the vine, the skin will split open and my mouth will fill with the sweet and tart burst of late spring tomato joy. Then will come the zucchini, the egg plant, the endless supply of beans, peas, parsnip....etc. It's a joy to wait. Then after summers past, I'll be searching the forest floor for the first hints of the new mushroom season. And life goes on. 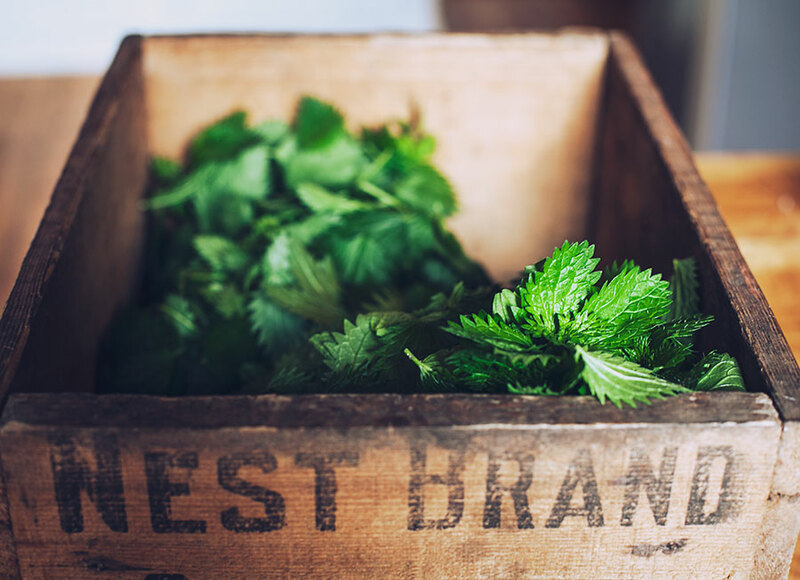 Right now nature is doing her best to suggest that spring is not far away, and that means fresh nettle is growing under the sheep stock camps, farm shelters and unwanted in people's gardens. Enter the stinging nettle picker (that me dudes). I love to devour that stinging beast, it ends up in pesto, soup, in pasta, in gnocchi and in scramble eggs with goats cheese. It's just rad all round really. And it's at it's best in early spring, when the soil is damp and the change of weather arrives. It's worth the annual wait. After an hour of freezing fly-fishing on Lake Learmonth we did a bit of Sunday road tripping, doing our best to go down all the roads we'd never been down before, a metaphor for my approach to life really. We did some fairly disorganised exploring and looking for new hunting, fishing and foraging locations. 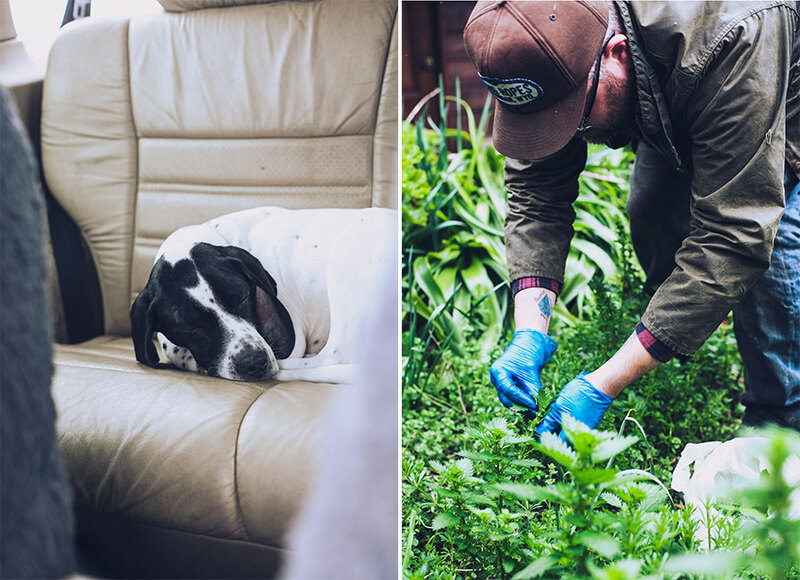 On top of the stunning Mt Beckworth we decided to head on down to my nettle picking location and fill the foraging box with a bunch of the nasty nettle. We picked a decent haul, took it home and blanched it to be used during the week most likely in soup and in a pesto. *NB. You can't get help these days. Henry sleeping on the job. If you've never tasted stinging nettle, it has a similar taste to spinach, but much more enjoyable. And with a good cheese and pine nuts and oil, it makes a stunning pesto over freshly made spaghetti. I'm salivating with the thought of tonight's dinner. 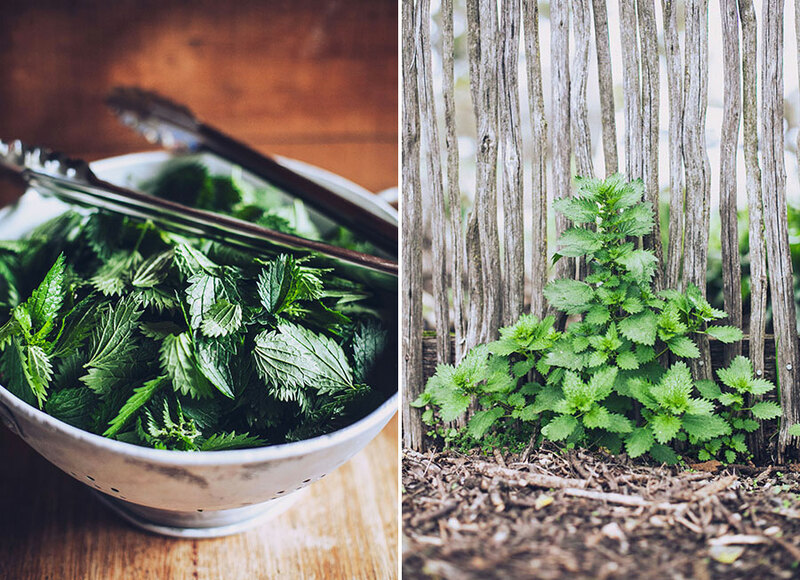 I have a few stinging nettle recipes in my upcoming book...if you're interested.